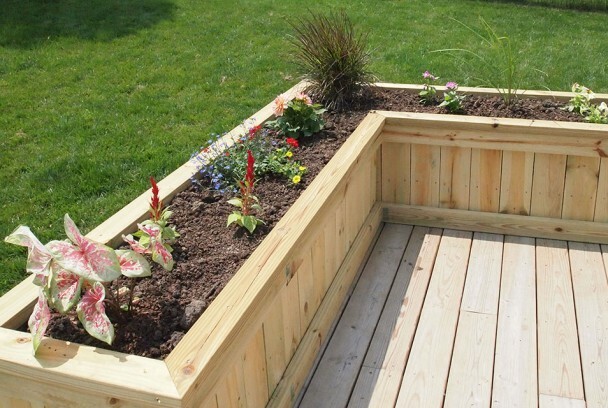 "Greg designed, built and installed two large custom planter boxes onto my existing deck. The planters are "L"-shaped and about 21' x 8' in size, so they are pretty large. The boxes run along the edges of my deck, completely encapsulating it except for the opening at the steps. He also built some moveable benches that can be placed anywhere to create a sitting area. "I contacted Greg and gave him a rough idea of what I had in mind. He then found a large sampling of planter box pictures and had me pick out the styles that I liked. I picked out a specific image and he used it as his template. From that single image and a rough sketch I made, he designed the planter boxes and sent over a computer rendering of what they would look like. "The most fascinating aspect of my story is that I have still yet to meet Greg in person. All of our communication was via email and phone calls -- I was out of town when he installed the boxes on my deck. Greg was very responsive both in email and on the phone. Greg and his team did a fantastic job and we couldn't be more pleased with the finished product."